Every year gear manufacturers roll out the latest and greatest products they have to offer. Sometimes they generate a collective "ho-hum” from consumers who see through repackaging, scant new features, and/or minimal new functionality. Some companies, however, always try to push boundaries, making musicians rethink the way they create. 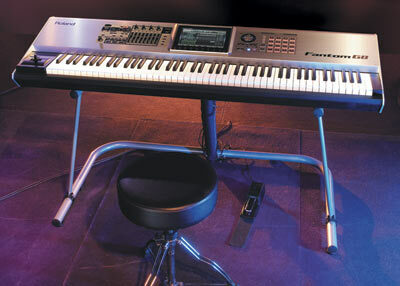 At the 2008 Winter NAMM show, Roland made such a move with the introduction of theFantom-G keyboard workstations. These new flagship systems have redefined the workstation genre with an advanced sound engine, 8.5" widescreen color LCD display, USB mouse connection, new expression technology, Studio and Live modes, and much more. There's a lot to cover, so let's jump right in. Fantom-G Workstations have a number of enhancements over their predecessors in theFantom-X Series. First up is an advanced sound engine, driven by a powerful new audio processor and loaded with 256MB of waveROM—twice that of Fantom-X models. This translates into 1,600 of Roland's SRX patches built in to every Fantom-G. Additionally, up to 22 high-quality DSP effects can be run simultaneously. Sound expansion has also been improved in the form of two ARX slots for Roland's SuperNATURAL sound sets. These new sound libraries offer incredibly expressive sound and a level of control never before seen in a synth. For example, with the ARX-01 Drums library, users can control parameters like shell depth, mic placement, head tuning, and muffling. And with the widescreen LCD and navigation controls, creating up to a 24-piece kit tuned to your specifications is a very intuitive process (especially when you put that USB mouse connection to use!) Also available is the ARX-02 Electric Piano board, with 40 classic presets, five different amp models, effects, and control over a number of parameters to create your own electric pianos. The Fantom-G Workstations deliver an amazing amount of assignable, realtime control over sounds, effects, and more. There's a mixer section with eight sliders and four knobs, Roland's D-Beam infrared controller, a pitch bend/mod lever, navigation wheel, the aforementioned USB mouse connection, and the dynamic pad bank. These 16 velocity- and aftertouch-sensitive pads have a number of modes that allow you to play drums or rhythm patterns, trigger samples and phrase sequences, switch arpeggiation styles, and more. In all, the pads can operate in 16 modes. It's an unprecedented amount of control that makes working with the Fantom-G in its various modes an absolute pleasure. In Studio mode, theFantom-G is an absolute creative powerhouse. Roland's newly designed audio/MIDI "power sequencer” allows 128 MIDI tracks and a whopping 24 tracks of audio. The Fantom-G is loaded with inputs to make recording audio simple. There's a combination XLR/1/4" input for a mic or guitar, complete with phantom power for condenser mics. Two 1/4" TRS ins and a stereo digital input are also provided, as well as a slot for a USB flash drive, and a USB 2.0 audio/MIDI interface built-in for integrating your Fantom-G with your favorite computer hardware and software. Just like in a DAW, you can use point-and-click editing, zoom tracks, mix, and even master your productions. A VST-/AU-compatible editor is also onboard for when you want to use theFantom-G within your computer-based DAW software. Roland clearly took the time to make the Fantom-G just as powerful a live performance tool as it is a creative one. In Live Mode, eight patches can be used simultaneously, creating what's called a Live Set. Each patch in a Live Set has its own effects processor (along with shared reverb and chorus), giving you an entire arsenal of sounds and effects to spice up your performances. What's more, using the Fantom-G's faders and knobs, controlling the mix, effects, and other parameters is effortless. The keyboard can be split or layered into up to eight zones for playing internal patches, triggering samples, and controlling up to 16 external devices for even more expression options in a live setting. Managing and switching between Live Sets is intuitive and seamless thanks to the new Patch Remain function. There are no abrupt cutoffs or glitches when switching between sets. Any effects or sustained notes in the set you're switching from will continue to ring out after you make the change. Also, the Favorite mode allows storage and instant recall of your favorite sounds. These can be stored in banks and brought up using the dynamic pads. The Fantom-G Series Workstations are an accomplishment in musical technology on a scale rarely seen in the industry. They're so deep, in fact, that this review could go on for pages and pages. I've only scratched the surface, but suffice to say that any serious player and/or producer will find much to love about the Fantom-G and its comprehensive feature set, expressive sounds, expansion capabilities, controls, and playability. Roland has succeeded in creating a series of workstations that are equally powerful in a studio environment as they are onstage. Click Here For Download of Four-Page Spec Sheet 44K PDF On The Roland Fantom Synthesizer. Click Here For Download of The Owners Manual 6.4 MB For The Roland Fantom Synthesizer.